Product prices and availability are accurate as of 2019-04-21 01:52:40 UTC and are subject to change. Any price and availability information displayed on http://www.amazon.com/ at the time of purchase will apply to the purchase of this product. Nested Naturals Choline supplement contains 500mg of Choline Bitartrate (VitaCholine), vital for pregnant and breastfeeding mothers. Studies have shown that when a baby receives proper levels of choline during prenatal development, they have a better chance of later having healthy, sharp brain functions and a lower risk of brain abnormalities. 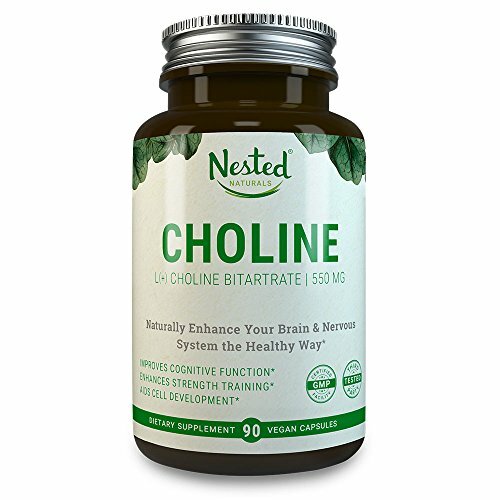 Nested Naturals Choline is great for keeping your brain mentally sharp and focused as well as maintaining proper brain health. Because choline is a component of your neurotransmitters, it may assist in preserving memory and combat other signs of cognitive decline. Choline has many benefits for both men and women. Choline has been shown to support cell structures, the central nervous system, exercise performance, and heart health in the human body. Every ingredient of every batch is tested by a 3rd party testing facility to guarantee there is as many amazing ingredients inside the bottle as the label says. 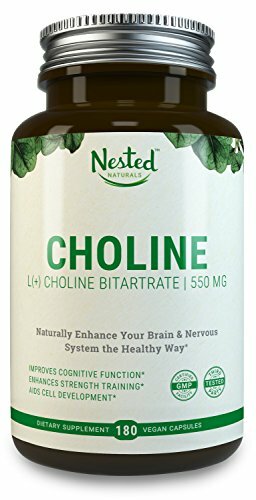 Nested Naturals Choline capsules are made of L + choline bitartrate. Although there are similarities between choline bitartrate and CDP choline and GPC choline they are not completely the same. All Nested Naturals products come with our Lifetime Guarantee. If at any point in the future you are not happy with your order, let us know and we will refund your entire purchase, 100% guaranteed. *WE HAVE A NEW NAME! * INTRANATURALS IS NOW NESTED NATURALS - We've changed our name to better reflect our grand vision of better supplements for all. Same great products, new name and logo. Have questions or concerns? Contact us via Amazon and we'll be happy to help. HELLO, WE'RE NESTED NATURALS. NICE TO MEET YOU. - We're a socially conscious company destined to transform the clutter and confusion around supplements. We believe in only using the highest quality ingredients, standing behind our products, 3rd party testing every batch, and donating to charity to make the world a better place. Every product we make is designed to improve your health, happiness, and overall wellbeing. We love our customers and hope you'll love us too. 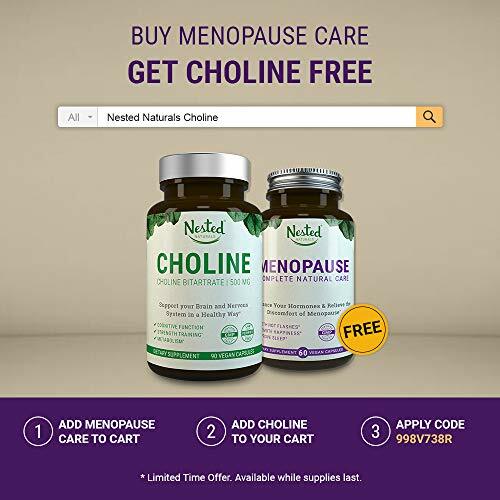 550MG OF CHOLINE FOR PREGNANT & BREASTFEEDING MOTHERS - Nested Naturals Choline supplement contains 550mg of Choline Bitartrate (VitaCholine), vital for pregnant and breastfeeding mothers. Choline is present for the prenatal development of your baby's brain, cells, and nerves. Studies have shown that when a baby receives proper levels of choline during pregnancy, they have a better chance of later having healthy, sharp brain functioning and a lower risk of brain abnormalities. 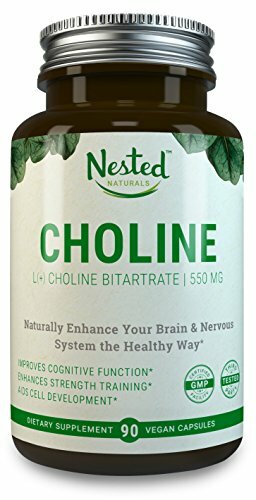 SUPPORTS COGNITIVE FUNCTION & MEMORY IN ADULTS & SENIORS - Nested Naturals Choline is beneficial for keeping your brain mentally sharp and focused as well as maintaining proper brain health. Because choline is a component of your neurotransmitters, it may assist in preserving memory, memory loss, and other signs of cognitive decline. The high-quality VitaCholine source of Nested Naturals Choline may help to enhance both cognitive function and memory in adults and seniors. 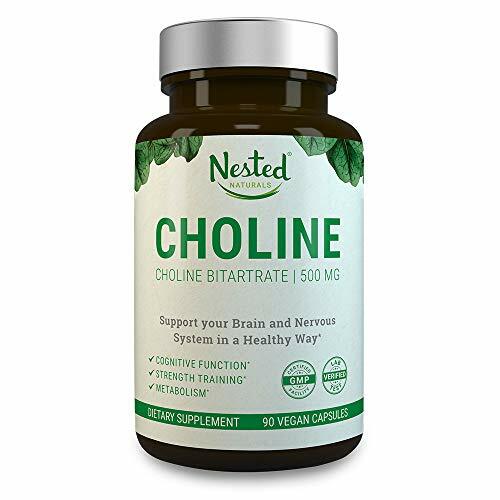 SUPPORTS BRAIN, NERVOUS SYSTEM, & CELL HEALTH - One of the major benefits of Nested Naturals Choline is that it is crucial for nerve functioning, assists in nerve signalling, and helps to maintain the membranes of brain cells. Nested Naturals Choline capsules are made of L + choline bitartrate. Although there are similarities between choline bitartrate and CDP choline and GPC choline they are not completely the same.